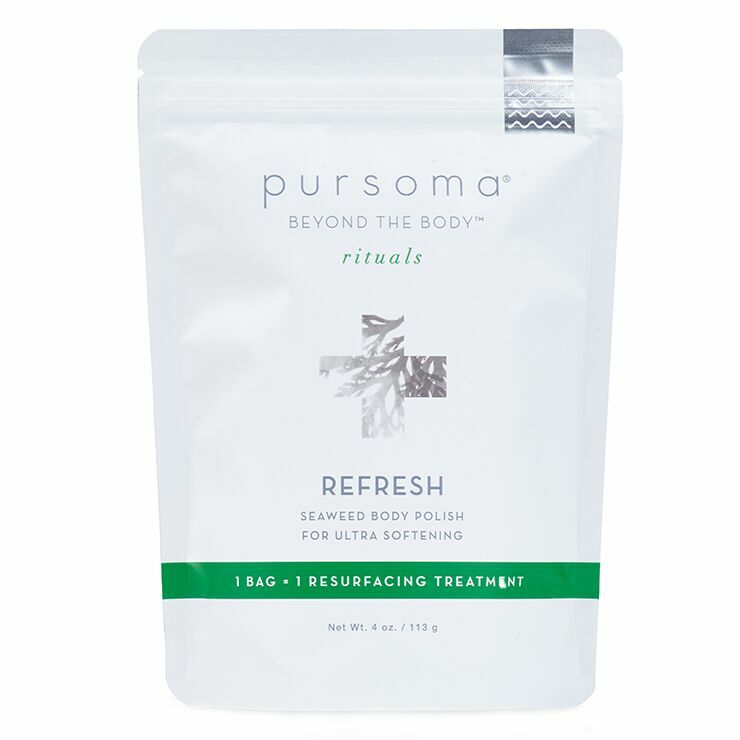 An indulgence for the body, use Pursoma Refresh Seaweed Body Polish to make skin feel soft, soothed, and hydrated. Formulated with carefully selected marine ingredients, this tropics-inspired skin scrub contains two components – a scrub blend and an oil sachet. The scrub is made with brown and green algae to boost the appearance of luminosity while lending a purified feel to the skin. Oat extract offers a softened feel, while quinoa makes skin look smooth and youthful. Rice bran oil moisturizes and visibly improves skin tone and fine lines. Skin feels instantly nourished and renewed. The perfect treat for dry or damaged skin. Combine the oil sachet into the scrub mixture and mix well. Apply scrub to dry skin, from shoulders to feet, working in gentle circular motions. Step into warm shower and moisten the scrub, massaging skin. Rinse thoroughly and forgo soap or body cleanser. Pat dry and moisturize with your favorite body oil or cream. Polish: Sodium Chloride (Sea Salt), Carthamus Tinctorius (Safflower) Seed Powder, Laminaria Digitata (Brown Algae), Cocos Nucifera (Coconut Oil And Powder), Simmondsia Chinensis (Jojoba) Seed Oil, Chlorella Vulgaris (Green Algae), Hydrolyzed Avena Sativa (Oat), Hydrolyzed Quinoa, Tapioca Starch, Tocopherol (Vitamin E). Oil: Oryza Sativa (Rice Bran) Oil.